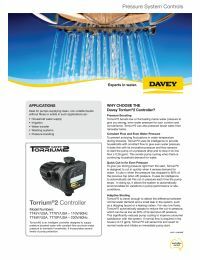 The Davey BT20-30 Mulitistage Centrifugal Booster Pump System is an economical, compact booster system driven by quiet, efficient stainless steel pumps. All B-Series Pumps do flows of 20gpm and as high sd 45 gpm, and can be installed in parallel for higher flows. These pumps operate extremely quiety, featuring low noise between 54 and 56 dBa. The BT20-30 is ideal size for a small residences, mobile homes, cottages and yachts. 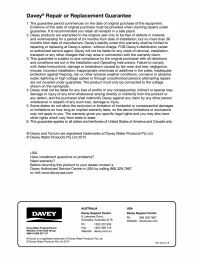 Please see the installation manual below to get all the details of the repair or replacement Gaurantee. This pump has been third party tested and certified to NSF / ANSI Standard 61 & CSA Approved. These high quality booster pumps are compact, quiet, low maintenance, and easy to install. Economical Choice. 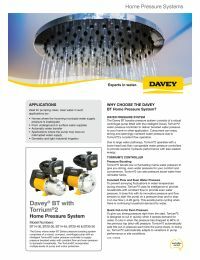 The Davey BT20-30 Booster Pump System features a cut-out at low flow and cut-in at 80% of the cut-out pressure providing a constant, even pressure flow of water. The system also has automatic recognition of small pressure loss (RO, ice makers, etc.) to reduce needless cycling. Providing you with smooth, even pressure for showers, sprinklers and all your household water needs. Dependable & Safe. This pump has a built in sacrificial varistor for electrical power surges, high current shutdown, low voltage indication, and dry run protection with sequential automatic re-start. The system also features a water leakage detection system, which will minimize you pump's cycling. Additionally, high water temperature protection and automatic restart below 60℃ is built-in. Variety of Applications. Homes with low incoming municipal water supply pressure, automatic water transfer, domestic, light industrial, and garden irrigation, and applications where pressure "cycling" must be avoided or where the pump may have interrupted water supply. Quality Construction. This product is made from 304 stainless steel and corrosion-resistant materials, and has selectable vertical and horizontal delivery outlets. It also features an LED operation and fault indicator, which displays system operating status. Three year warranty starts the day of installation - customer receipt is the warranty ticket.